VFA Delegates: T. S. Marshall & W. C. Donaldson. Games Played. 23. Won 13. Lost 8. Drew 2. Goals Scored. 73 for. 61 against. Top goal scorer; Jack Baker 20. Richmond and University admitted to the Association as senior clubs. V.F.A. changed the game to 4 quarters to give sides better use of a wind advantage. Carlton played and defeated a Carlton Star 23 side. Carlton 6.14 defeated Melbourne 1.7 before a crowd of 8,000. "Though the most ardent friends of Melbourne and Carlton can hardly claim for them the merit and prestige of bygone days, their matches still possess a charm for the public." Carlton had an indifferent year beginning well, but form fell away as it's wins were followed by losses. Losses included South Melbourne twice, Williamstown, Essendon, and Hotham. 1885. Premiers.South Melbourne, 2. Essendon, 3. Geelong, 4. Carlton. April 25 vs Star of Carlton at Princes Oval. May 02 vs Melbourne at M.C.G. .....09 vs South Melbourne at S.M.C.G. .....16 vs Fitzroy at M.C.G. .....30 vs Hotham at Hotham Recreation Reserve. June 06 vs Williamstown at Williamstown. ......13 vs Ballarat at M.C.G. ......20 vs Richmond at Richmond. ......27 vs Melbourne at M.C.G. July 04 vs Fitzroy at Fitzroy. ......11 vs Essendon at M.C.G. ......18 vs Geelong at E.M.C.G. ......25 vs University at University. Aug. 01 vs Richmond at Princes Oval. ......08 vs Essendon at E.M.C.G. ......15 vs Williamstown at Princes Oval. ......22 vs Geelong at Geelong. ......29 vs Melbourne at Friendly Societies' Ground. Sept. 05 vs South Melbourne at Princes Oval. ......12 vs Hotham at Princes Oval. ......19 vs Univesity at Princes Oval. ......26 vs Fitzroy at Fitzroy. 1885 The Melbourne Football Club lose their ground in Yarra Park, and a separate Melbourne Football Ground was established at the Friendly Societies Ground, where Olympic Park, now the Lexus Centre is today. Melbourne would not play it's home games at the M.C.G. until 1890. 1885 Carlton play their first home matches on the M.C.G. Some details are missing, if anyone has these please contact Blueseum. The North Melbourne Advertiser published the details of the Town Council meeting of the proposal to alter the name from the of Town of Hotham to that of North Melbourne. Hotham Football Club would change it's name to North Melbourne in 1888. Carlton F. C. AGM held at the Carlton Orderly Room. The balance sheet showed a credit balance of £59 14s 11d ($119.49) as against a debit balance the previous year. Second twenty medals presented to C. Jackson and C. Carter. Mr. Cook's prize for excellence in play went to M. Lemmon. Illuminated addresses were presented to Messrs. S. Bloomfield, F. Spear, and J. Melville, for recognition of their services in the first twenty. The Treasurer, Mr. Hearne received a gold watch and an illuminated address for his services to the club. Mr. T. P. Power was presented with the Challenge Cup won by the club in 1871. Patrons; Messrs, J. Pigdon, E. Latham, and J. Bell. Hon Sec. Mr. W. C. Donaldson. Treasurer; Mr. M. B. Hearne. Vice captain; Mr. F. Johnston. V.F.A. meeting held at Young and Jackson's Hotel. Richmond and University are to be admitted into the Association as senior clubs. University's colours are blue and black. May 2 will be the opening day of the 1885 season. After July 4, Melbourne will play it's games on The Friendly Societies Ground. CRICKET CHATTER - NEW GROUND? "It is to hoped that the members of the Carlton club will be successful in their efforts to secure a new ground on Princes-park. The old ground, small as it is, will be further encroached upon shortly by the civic authorities, and the members are working up all the influence they can to obtain a fresh site, so that the large and populous district may have a ground worthy of the neighbourhood. With a first-rate ground, large enough for football purposes, the Carlton club would receive a large influx of members, would net a handsome revenue from football matches, and would thus be enabled to effect improvements which would make the ground an ornament to the locality." "When the Carlton Football Club trained at Professor Miller's Gymnasium they went through the ordinary course of exercise and diet. In addition, however, they were treated to frequent work on the spring board, in order to strengthen the muscles of the legs." Carlton held a practice match at Princes Oval. "A letter was read from Mr. J. H. Cameron, of the Carlton Football Club, pointing out the dangerous results likely to occur under rule 14 of the Association's laws, which permitted pushing with the hands when the player was in rapid motion within five or six yards of the ball. He suggested that the rule should be altered. The chairman did not consider it necessary to alter the rules, as the game had been getting less rough every year. The secretary, in order to meet the case, moved that the match committee should perform the functions of the late rules committee, the former committee to consist of Messrs. G. F. Major, Boyd and Rannard. Carlton's VFA delegates for 1885 are T. S. Marshall and W. C. Donaldson. Many of the new players played well. 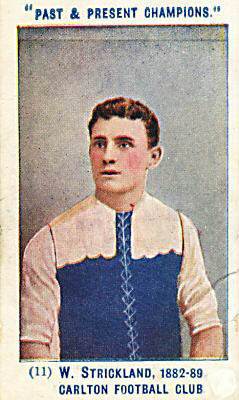 Boyd of the Launceston Club "shone out prominently" for the Blues. The comings and goings for 1885 at Carlton. Bloomfield has gone to N.S.W. J. Creevy, Alex Mair, A. Wilson, Dunn and McInerney from the Star of Carlton. Breen and W. John Eadie from Sunbury. "These should go far to filling up any gaps that may arise in the ranks through present or future defections, or inefficiency on the part of the old players, and help to maintain the reputation of the old club." All vantage points were packed and the goals were pitched east-west. Carlton winning the toss kicked to the western end. New player W. Strickland picked up a lot of possessions because the guernsey he wore had red facings on it, which was confusing, and at times he was thought to be a Melbourne player. Baker (Capt. ), Breen, J. Creevy, Cook, T. Cameron, J. Cameron, Crapp, Carew, Drew, Hyland, Joyce, Johnstone (Vice Capt. ), Alex Mair, O'Bern, W. Read, Rickards, Strickland, Watting/Watling, A. Wilson, A. Whelan. Umpire; T or F. Nally, Essendon. Goals; Baker 3, A. A. Wilson 2, Cameron. Best; Baker, Cameron, Johnstone, O'Bern, Strickland, Wilson. New players; Breen from the Sunbury club; J. Creevy, Crapp, Alex Mair, and A. A. Wilson from the Star of Carlton; W. Read from the South Yarra club; Watling from South Australia, Cameron brothers returning after resting for a season; W. Strickland from the Brunswick club. Beere, -Charles, Cooly, Cader, Careors/Carsons?, Carter, Dalgliesh, Coulthard, Davy, Elliott, Hadley, Jackson, Lemon, McDonnell, Merryman, Murray, O'Shannessy, Oliver, Rickards Jno; Slattery, Skinner, Urquhart, Woodburn. "Sixteen thousand spectators attended the two principal football matches played at Melbourne on Saturday last, and all paid at the gates. Would a fifth of that number be induced to pay in Sydney?" Play commenced at 3.15pm, ground heavy and weather threatening, but the rain held off. The Sportsman May 13, said; "The South Melbourne fellows looked very gay in their uniforms, with a thin, blood-red stripe on the white." The Sportsman's reporter had some differing players listed as goal kickers for South compared to other newspaper reporters, and he called for the numbering of players as done for racehorses at Flemington. "Yes, let's stick a big number on them, before and behind - brand 'em." Former Blue, Hannaysee now with South Melbourne. New recruit, Breen took a speccy in the second half rising at least a foot above the heads of the other players. He went back and kicked the goal. Despite the difference in the scores, the Blues played excellent football. However, the Sportsman said; ".... but the Carlton men will have to give more attention to places, playing together, and little marking if they are to secure a leading position in this year of grace, as football has long passed the days of brilliant individual effort, and is now a science, requiring tact, judgment, discipline, and many other elements for its successful pursuit." Baker, Breen, Cook, J. Creevy, Crapp, T. Cameron, J. Cameron, Drew, Hyland, Johnston, Joyce, Alex Mair, O'Bern, Rickards, Strickland, Regan, Ulmer, Watling, A. Wilson, Whelan. Umpire; C. W. Dunn, ex South Yarra. Best; Breen, Drew, T. Cameron, Johnston, Hyland. Players mentioned; (15) Whelan, Cook, Joyce, O'Bern, Strickland, Baker, Breen, Johnston, A. Wilson, Watling, Drew, J. Creevy, Hyland, T. Cameron, J. Cameron. Baker, Breen, Creevy, Cook, Crapp, J. Cameron, T. Cameron, Drew, Hyland, Johnston, Joyce, Mair, O'Bern, Rickards, Strickland, Regan, Ulmer, Watling, Wilson and Whelan. Carlton Seconds played South Melbourne on the Princes Oval. Best; Fitzgerald, Martin, Rickards, and Coulthard. Carlton played Fitzroy on the M.C.G. Half the regular Carlton back line were absent. Johnston, Crapp, J. Cameron and Watling did not play. Poor kicking for goal by Fitzroy prevented an even greater defeat. Baker, Breen, Cook, J. Creevy, Carter, Cameron, J. Cameron, T. Cameron, Dunn, Drew, Hyland, Joyce, Alex Mair, McInerney, O'Bern, Rickards, Regan, Reid, Strickland, Whelan, Wilson. Best; Baker, Drew, McInerney, Cameron, Hyland, O'Bern. Players mentioned; (11) Baker, Hyland, Carter, Breen, A. Wilson, Drew, Joyce, McInerney, Cameron, O'Bern, Reid. Carlton players met at Spencer Street (Southern Cross) station at 7pm prior to departure for Kyneton. May 25 Monday, Queens Birthday Holiday. Carlton played Kyneton at the Kyneton Racecourse. The Blues were greeted by an enthusiastic crowd who paraded with the teams through the streets "with the beat of drums and banners flying." The Blues were treated to some choice barracking by the locals. Breen scored the first two goals, and then one from Carter in the first half. Breen scored the first two of the second half goals. These were followed by goals to Carter, Whelan and Breen. In fact the Kyneton Observer said Breen didn't miss, he kicked 5 goals straight! The newspaper also said Carlton was captained by Rickards jnr. The teams were entertained at Mr. A. J. Wilson's Commercial Hotel where more than 60 people attended. Baker, Breen, Carter, Cook, Crapp, Jas. Cameron, Jno. Cameron, Drew, Hyland, Joyce, Leydin, Lemon, Melville, Alex Mair, McInerney, O'Bern, Reid, Regan, Strickland, Woods, A. Wilson, Whelan. Goals; Breen 5, Carter 2, Whelan. Players mentioned; Breen, Carter, Whelan, T. Cameron, Drew, Joyce, McNamara, Cook, Rickards? The team met at A. J. Kellys Lygon street at 3pm Saturday or at Spencer Street Station at 3.15pm sharp. Beere, Cool(y), Connaughton, Carsons, Dunn, Dunn, Davie, Glasscock, Hadley, Jackson, Launders, Merriman, Mair, Nairn, Oliver, O'Shannessy, Slattery, Taylor, Urquhart, Woodburn, Coulthard, Elliott, Dagleish. Carlton played Hotham at the Hotham Reserve, North Melbourne. Baker won the toss and kicked with the aid of a strong breeze. The locals were unlucky not to win as the Blues failed to score after half time. Baker, Breen, Cook, J. Creevy, Crapp, Cameron, Cameron, Drew, Hyland, Joyce, Johnston, Leydin, Alex Mair, McInerney, O'Bern, Rickards, Regan, Strickland, Whelan, Wilson. Players mentioned; (16) Cameron, Baker, Breen, McInerney, Joyce, Cook, Leydin, Johnston, A. Wilson, Drew, Alex Mair, Whelan, Hyland, Melville, O'Bern, Rickards. Carlton Second Twenty played Hotham on the Princes Oval. The Australasian writing about the the sixth annual report of Tasmanian Football Association says unsatisfactory relations exist between the Football and the Cricket Associations where the cricket clubs receive 75% of the football gate takings! A situation if it existed here (Melbourne) would be quickly sorted out. Carlton played Williamstown at the Gardens Reserve, Williamstown. The Villager's colours were yellow and black. The ground was very muddy after 48 hours of rain. Both teams were missing prominent players. Johnson, J. Creevy, Hyland, and Cameron did not play. Baker won the toss and strangely kicked to the southern goal against a strong westerly breeze. Baker (capt. ), Breen, Cook, Crapp, Cameron, Cameron, Drew, Joyce, Leydin, Alex Mair, Melville, McInerney, O'Bern, Rickards, Reid, Strickland, Ulmer, Woods, A. Wilson, Whelan. Players mentioned; (15) Baker, Breen, Crapp, Strickland, Rickards, A. Wilson, Cook, Tom Cameron, Cameron, Melville, Whelan, Joyce, O'Bern, Alex Mair, Drew. Carlton played Ballarat at the M.C.G. Crowd; only 300 in attendance. Wet, slippery, conditions did not help the standard of play. Ballarat were overwhelmed in second half. By the end of the game all of the players, including the umpire, were wearing a uniform of the same colour, that of mud! Baker, Breen, Cook, Crapp, Cameron, Cameron, Drew, Johnston, Joyce, Leydin, Alex Mair, McInerney, O'Bern, Rickards, Reid, Strickland, Ulmer, A. Wilson, Woods, Whelan. Goals; Cameron, A. Wilson, Breen, Leydin. Players mentioned; (12) Baker, Cameron, O'Bern, Whelan, Reid, Ulmer, Rickards, A. Wilson, Alex Mair, Breen, Leydin, Drew. Carlton Second Twenty played Royal Park at Royal Park. Reported in the Australian Town & Country Journal that the Sydney City Football Club which has only been established a few weeks is in a flourishing condition where many members have already joined the club. Richmond's colours are yellow and black. This was the very first meeting between these clubs. This was the largest attendance yet seen at the ground. Baker won the toss and Carlton kicked to the southern goal. The Blues started the match playing 19 men due to the absence of O'Bern, Crapp later replaced him. J. Baker (Capt. ), Breen, Cook, Cameron, J. Cameron, Drew, Hyland, Joyce, Knowles, Leydin, Alex Mair, McInerney, O'Bern, Rickards, Reid, Strickland, Ulmer, Whelan, A. Wilson, Woods. Best; Baker, Drew, Whelan, J. Cameron, Alex Mair, Ulmer, Hyland, Knowles. Players mentioned; (15) Crapp, Baker, J. Cameron, Ulmer, W. Read, Cook, Whelan, Leydin, A. Wilson, Joyce, Drew, Knowles, Breen, Alex Mair, Hyland. Showery weather and the ground was sodden. Baker won the toss and Carlton kicked to the western goals. Melville is mentioned playing in The Argus report. Aitken, J. Baker (Capt. ), Breen, Cook, Cameron, Cameron, Drew, Hyland, Johnston, Knowles, Leydin, Alex Mair, McInerney, O'Bern, Rickards, Strickland, Ulmer, A. Wilson, Woods, Whelan. Players mentioned; (15) O'Bern, Whelan, Baker, Knowles, Alex Mair, Drew, Aitken, Breen, Ulmer, Johnston, Strickland, Cook, Melville, Leydin, Woods. Armstrong, Beere, Burwood, Cooly, Coulthard, Dagliesh, Davie, Dunn, Elliott, Forman, Glasscock, Hadely, Lemon, Manly, Martin, Matheson, Merriman, Oliver, O'Shannessy, Woodburn. Former Blue, Alick Coventry umpired the match between Williamstown and Hotham. The question as to whether public reserves which have been vested in local municipal bodies for the general public good, can or cannot be used by clubs for the purpose of charging for admission to sports, etc., is at present occupying the attention of the public. The following extract from the Herald, which bears on the subject, will serve to show in what light this subject is viewed in the metropolis. It says: - On Monday next a deputation is to wait on the Minister of Lands to ask him to reserve to the Carlton Cricket and Football Clubs that portion of the Prince's Park which has for a length of time been used as a cricket ground. It seems that the City Council has latterly expended considerable sums of money in trenching and planting a portion of the ground, and this is to be the excuse for requesting a better title. At the outset, it may not be unnecessary to remind Mr. Tucker that Princes Park is one of the public reserves and is in reality the property of the public. The parks and gardens of Melbourne - the lungs of the city and its suburbs - are something of which we are justly proud, and any attempts to curtail them, or to close any portion of them to the public will be resented with an ardour which cannot be withstood. No one has any desire to interfere with or throw obstacles in the way of the practice of invigorating athletic sports, but it must not be forgotton that they are not of that paramount importance which would entitle them to overwhelm the rights of the citizens. Whatever may be said to the contrary, the object in view is to gain the power to charge for admission, or in other words to make the citizens pay before being permitted to enter upon their own estate. The main question is the advisableness of filching any portion of the public estate, and conferring it upon a private club. Carlton played Fitzroy at the Fitzroy Cricket Ground. A fine day with no wind. The largest crowd yet seen at the ground. J. Cameron did not play. Baker won the toss, and Carlton kicked to the eastern goal. The game commenced at 3.10pm. This was the Blues first victory against Fitzroy. Aitken, Baker (Capt. ), Breen, Crapp, Cook, J. Cameron, Drew, Hyland, Joyce, Johnston, Knowles, Leydin, Alex Mair, O'Bern, Rickards, Strickland, Ulmer, Whelan, A. Wilson, Woods. Best; Whelan (BOG), O'Bern, Woods, Johnston, Alex Mair, Breen, Baker, Cook. Players mentioned; (17) Knowles, Baker, Strickland, Woods, Whelan, Alex Mair, Breen, Johnston, Crapp, Cook, Drew, Joyce, O'Bern, Aitken, Leydin, Rickards, Ulmer. Carlton Reserves played Fitzroy on the North Fitzroy Cricket Ground. Very much a one sided game, Carlton having it all their own way. The Sportsman newspaper commenting on the Carlton-Fitzroy match, and the 1885 version of the tagger. "One of the most noticeable and objectionable features in the game was the system of "watching" adopted upon this occasion, Muir being told off to keep the Carlton captain, Baker, under surveillance, whilst the steps of the rival skipper, McShane, were dogged by the Carltonian Cook. This quartette took a lively interest in each other's movements, and appeared to act apart from the main body of their respective teams. This system of detailing one player off for the express purpose of hanging onto an opponent, and preventing him getting the ball by fair or foul play, is most undignified for the "watcher," "contemptible" on the part of the side resorting to such tactics, and altogether so "unsportsmanlike" that, where carried on in a noticeable manner, the offender should be disqualified from playing." The day was fine with no wind, but the ground was wet. Essendon were 3-1 favourites to win. Essendon won the toss, and Whelan kicked off to the northern goal. A first class display of the game from both teams. Fast and exciting from start to finish. The Dons scored 8 consectutive behinds in the second half. Baker, Breen, J. Cameron, T. Cameron, Crapp, Cook, Drew, Hyland, Johnston, Joyce, Knowles, Leydin, Alex Mair, O'Bern, Rickards, Strickland, Ulmer, Whelan, A. Wilson, Woods. Best; Whelan, Alex Mair, Baker, J. Cameron, Woods. Players mentioned; (18) Whelan, Crapp, Knowles, Cook, Alex Mair, Breen, Baker, Johnston, Joyce, O'Bern, T. Cameron, Woods, Strickland, J. Cameron, Ulmer, A. Wilson, Leydin, Drew. Best; Short, Merriman, Long, Gregory, Kelly, Longfellow and Umpire. Carlton played Geelong at the East Melbourne C. G.
The Pivots were missing 5 leading players. Playing in wet slippery conditions the Blues downed the favourites Geelong with a withering 4 goal burst in 5 minutes. Mair had soccered through the first goal, then Whelan hit the post. Shortly afterwards Whelan kicked the second, Woods the third, and A. Wilson the fourth. The Blues put on three quick goals just before half time, leaving the crowd non plussed, then added another at the start of the second half. Geelong started the second half determined to turn things around and attacked. After the Blues seventh goal when the the teams lined line up for the re-start, the Dark Blues were greeted with the kind of applause that was generally reserved for,"a favourite actor by an enthusiastic audience when called before the curtain." Baker, Breen, Crapp, Cook, Cameron, Cameron, Drew, Johnston, Knowles, Leydin, Alex Mair, McInerney, O'Bern, Rickards, A. Robertson, Strickland, F. Spear, Whelan, A. Wilson, Woods. Umpire; H. A. Goding, South Melbourne. Goals; Baker 2, A. Wilson 2, Woods, Whelan, Mair. Best; Whelan, Baker, O'Bern, Johnston, Cook, McInerney, Strickland, Knowles, Drew. Players mentioned; (20) Cook, Rickards, Whelan, Knowles, Johnston, Crapp, Alex Mair, Woods, A. Wilson, Strickland, O'Bern, Baker, J. Cameron, Drew, Breen, Leydin, T. Cameron, McInerney, Spear, Coventry. "The following remarks by the Victorian "Follower" in reference to the umpire's work in the match played between Essendon and Carlton on Saturday, are well worthy of perusal:- Mr. Goding, the central umpire, had more than his fair share of work to do, the players continually infringing the rules, Essendon being unfavourably conspicuous in this respect. As usual when a football umpire endeavours strickly to enforce the rules, Mr. Goding's decisions were received with cheers from the partisans of those in whose favour he decided, and groans from the enemy's camp. "Barracking" has become such an inseparable characteristic of the game, and is now carried to such a senseless extent, that fair comment from the mass of those who allow themselves to become victims to excitement never need be expected; for men who commence to roar and rave when the ball is first kicked off can hardly be expected to judge the merits of the game dispassionately, and I am afraid that your real red hot "barracker" is as a rule singularly blind to that which he rather not see." Carlton played University at the University Cricket Ground. This was to be the first meeting between the Blues and the 'Varsity. After last week's great effort against Geelong, many thought that this game would be a formality for the Blues. Carlton won the toss and kicked to the Western or Cemetery goal. The Blues won a hard fought game, the Students answering almost every Carlton goal. Many players were penalised for infringements. Baker, Breen, Crapp, Cook, Cameron, Cameron, Drew, Johnston, Joyce, Knowles, Leydin, Alex Mair, McInerney, O'Bern, Rickards, Robertson, Reid, Strickland, Whelan, Wilson. Best; Whelan, Baker, Strickland, Cook, Alex Mair, Leydin. Players mentioned; (8) O'Bern, Baker, Leydin, Whelan, Stickland, Cook, Alex Mair, Breen. The Australasian lists the teams in order of performance so far this season. First; South Melbourne, Essendon, Geelong, Carlton, Williamstown, Hotham, Fitzroy, Melbourne, Richmond, and University. Carlton had Played 11, Won 6, Lost 3, Drawn 2, Goals For 39, Against 35. Free admission, as the game is played on Princes Oval. However, the discomfort factor will be high, as getting a good view of the game is almost impossible. A magnificient day for football, however the ground was infested with weeds, and the playing surface needed a good rolling as there were small hollows which made bouncing the ball almost impossible. Princes Oval has poor amenities, especially for women. The club wants to improve the facilities, but is hamstrung by the Melbourne City Council who will not allow the club to spend money on permanent structures. Former Blue George Smith was the first captain of Richmond. Baker won the toss and the Blues kicked with the aid of a slight breeze to the western goal. Richmond were the speedier of the two sides and were led by former Blue, George Smith. Baker, Breen, Bourke, Coventry, Crapp, Cook, J. Cameron, T. Cameron, Drew, Johnston, Knowles, Alex Mair, McInerney, O'Bern, Reid, Rickards, Strickland, Whelan, A. Wilson, Woods. Best; Whelan, Baker, Alex Mair, Woods, Johnston, J. Cameron, T. Cameron, McInerney, Crapp. Carlton 4th. Played 14, Won 9, Lost 3, Drawn 2, Goals For 53, Against 39. "That the residents of Dunedin, the capital of Otago, and the most populous city in New Zealand do not support Rugby football liberally, is attested by the fact that the game receipts of the Otago Rugby Union for last season was £211 4s 6d, a sum not equal to the receipts of a single good match played at Melbourne." Final game for the year at this venue. The ground was in very good condition and the weather was fine. Baker won the toss and Carlton kicked to the southern end. Strickland was absent, and J. Creevy played. Baker, Breen, Bourke, Crapp, Cook, Cameron, Cameron, Coventry, Drew, Johnston, Knowles, Leydin, Alex Mair, Melville, McInerney, O'Bern, Strickland, Whelan, A. Wilson, Woods. Best; Baker, J. Cameron, Coventry, Woods, Cook, Whelan, O'Bern. Players mentioned; (17) Baker, T. Cameron, J. Cameron, Johnston, Cook, Whelan, O'Bern, Alex Mair, Woods, Crapp, J. Creevy, Coventry, McInerney, Bourke, Knowles, Melville, Drew. Carlton 5th. Played 15, Won 9 Lost 4, Drawn 2, Goals For 56, Against 45. The Blues have found the Seasiders hard to beat in recent years. The Blues kicked with the wind. Williamstown quickly scored a couple of behinds which unsettled the Blues for a short time. The home side were disappointed at the break, that they had not taken full advantage of the wind. However, the Blues played magnificantly against the wind in the last half. Baker scored the first goal and Breen the second, a third goal kicked by Whelan was disallowed by the goal umpire. Aitken, Baker, Breen, Burke, Coventry, Crapp, J. Cameron, T. Cameron, Drew, Hyland, Johnston, Jackson, Leydin, Morgan, McInerney, O'Bern, Strickland, Whelan, A. Wilson, Woods. Players mentioned; (11) Baker, Breen, Whelan, Johnston, O'Bern, J. Cameron, Strickland, Hyland, A. Wilson, Woods, T. Cameron. Carlton 5th. Played 16, Won 10, Lost 4 Drawn 2, Goals For 58, Against 45. "It is a pity that the Carlton Football Club cannot be complimented on their good nature or the breadth of their views. W. Read the following answer to the request of the association for assistance:-"
"Hon. Secretary Victorian Rowing Association. "W. C. Donaldson, Hon. Sec. C. F. C."
"Are the Carlton Football Club aware that the majority of the rowing clubs represented on the committee - that the constitution of the association is not framed in the interests of any class, but of all oarsmen alike - and the fact of the intercolonial race (one only of many matters coming within its control) being closed to manual labour is originally due to New South Wales? Perhaps the Carlton were not previously aware of these facts. In any case the reply is not such as one would expect to be given by a sporting club, nor does it show at all a generous spirit." Carlton played Geelong at Corio C. G; Geelong. 500 Blues fans accompanied the team on the special train to Geelong. The day was cold, but fine, with the wind blowing diagonally up the ground, just about equalising the slope. The Pivots in the end were too good for the Blues. Baker won the toss and Carlton kicked to northern end. Play began at 3.20pm. The Blues early in the game were running rings around the Pivots, but failed to put the score on the board and kicked 5 consecutive behinds from shots at goal. Donovan played, mentioned in The Argus report. Aitken, Baker, Breen, Burke, Crapp, Coventry, Cameron, Cameron, Drew, Hyland, Johnston, Jackson, Leydin, Melville, McInerney, O'Bern, Strickland, Whelan, A. Wilson, Woods. Best; A. Wilson, Breen, Melville, O'Bern, Crapp, Johnston, Jackson. Players mentioned; (16) Baker, Woods, McInerney, Melville, A. Wilson, Crapp, Whelan, T. Cameron, Strickland, Aitken, Donovan, Jackson, O'Bern, Johnston, Breen, Coventry. Carlton 4th. Played 17, Won 10, Lost 5, Drawn 2, Goals For 59, Against 49. Melbourne played their first match on their new ground, The Friendly Societies' Ground, against South Melbourne. Near where Gosch's Paddock is now located. Between Swan Street and the Yarra River. "The new ground which is egg shaped has been enclosed with a substantial picket fence, around which a cinder path, about three yards wide, has been laid down. A temporary reserve will be put up for to-day's match, but by next year the club hope to have a commodious grandstand and pavilion erected." For a description of the ground, see Pre VFL Venues, scroll to the bottom of page. At the V.F.A. meeting a proposal to play the English club, the London Rovers at both English and Australian Football was turned down as delegates felt that it would interfere with club contests. The Hotham club informed the V.F.A. that they would alter their uniform from horizontal to vertical stripes to aviod clashing with Geelong. The Essendon delegate asked the V.F.A. to overturn the goal umpire's decision of a no goal against South Melbourne. The rules state quite clearly that the the goal umpire is to be the sole judge of a goal. The dispute arose because the V.F.A. in spite of warnings, had recently overturned it's decision to have paid neutral goal umpires at each match, and had reopened the door to partisan decisions. The goal umpire said that the ball had hit the goal post, and then it hit a small boy who was standing up against the post. The Essendon captain and team mates queried his decision, and said that it hit the boy first and would have gone through the goals. The V.F.A. voted and decided to overturn the goal umpire's verdict and awarded the goal and the game to Essendon! Carlton played Melbourne at the Friendly Societies' Gardens. An earlier report said the new ground was quite good, however it is narrower than most other grounds. Merriman replaced O'Bern in the side. Carlton player George Bragge returned from playing with Norwood F.C. in Adelaide. George ran out to the cheers of the Blues fans, and he played a prominent part in the game. Moderate crowd due to threatening weather. Heavy rain early in the match. Baker won the toss and kicked with a stiff breeze to the western end goals. Aitken, Baker, Breen, Bragge, Burke, Crapp, Cameron, Cameron, Drew, Johnston, Jackson, Leydin, Melville, McInerney, O'Bern, Strickland, Rickards, Whelan, A. Wilson, Woods. Goals; Bragge 2, A. Wilson 2, Merriman. Best; Baker, Bragge, A. Wilson, J. Cameron, Whelan, Crapp, McInerney, Leydin. Players mentioned; (12) Merriman, Bragge, Baker, Breen, Johnston, A. Wilson, J. Cameron, T. Cameron, Whelan, Crapp, McInerney, Leydin. Carlton 4th. Played 18, Won 11, Lost 5, Drawn 2, Goals For 64, Against 51. The Australasian; Senior club standings at the end of August. Essendon and South Melbourne tie for first place, then Geelong third, Carlton and Hotham about equal, Fitzroy, Williamstown equal sixth, then Richmond, Melbourne and University. Hanneysee now playing for South Melbourne. Except for those who arrived early and got a place near the picket fence, most of the spectators could not see the game and had to make do with catching glimpses of the play. A strong south westerly wind was blowing favouring one end, so it was an important toss of the coin. South won the toss and Carlton kicked to the Sydney Road end against the wind. The Blues played well in the first half despite the wind. Reports said the out come of the match would have been different if the Blues had had first use of the wind. Aitken, Baker, Breen, Bragge, Crapp, Cook, Cameron, Cameron, Drew, Johnston, Knowles, Leydin, Alex Mair, McInerney, O'Bern, Rickards, Strickland, Whelan, A. Wilson, Woods. Best; Whelan (BOG), Baker, Cameron, Rickards, Mair. Players mentioned; (16) Whelan, J. Cameron, Baker, A. Wilson, Alex Mair, Bragge, O'Bern, T. Cameron, Strickland, Crapp, Woods, Knowles, Leydin, Johnston, Aitken, Joseph Rickards. Carlton Second Twenty played South Melbourne at South Melbourne. Carlton 4th. Played 19, Won 11, Lost 6, Drawn 2, Goals For 65, Against 54. Mr. Marshall after receiving counsel, gave notice that at the next meet of the Association he would move to have the disputed goal decision awarded to the Essendon club rescinded. Crowd; in excess of 7,000. Carlton's Baker won the toss and kicked to the western or cemetery end slightly aided by the cross wind. A strong northerly wind confined a lot of the play to the southern side of the ground. Following on from last week, Hotham became only the second team to defeat the Blues on Princes Oval. Aitken, Baker, Breen, Bragge, Crapp, Cameron, Cameron, Drew, Johnston, Knowles, Leydin, W. Alex Mair, Melville, McInerney, O'Bern, Rickards, Strickland, Whelan, A. Wilson, Woods. Better players, Baker, Knowles, Strickland. Players mentioned; (20) Melville, McInerney, Baker, Frank Johnston, A. Wilson, Alex Mair, O'Bern, Breen, Knowles, T. Cameron, Woods, J. Cameron, Drew, Whelan, Aitken, Strickland, Rickards, Leydin, A. Wilson, Merriman. Carlton Second Twenty played Hotham on the Hotham Recreation Reserve, another report said at Royal Park. Carlton 4th, Played 20, Won 11, Lost 7, Drawn 2, Goals For 67, Against 58. Many thought that playing on the larger ground would help the 'Varsity boys. Carlton won the toss and kicked with the wind. Knowles dislocated his shoulder early in the first half. Aitken, Baker, Breen, Bragge, Cameron, Cameron, Drew, Johnston, Knowles, Leydin, Alex Mair, Melville, Merriman, McInerney, O'Bern, Rickards, Strickland, Whelan, A. Wilson, Woods. Emergencies; A. Alex Mair, Burwood. Goals; A. Wilson 2, Baker, Mair. Best; Baker, T. Cameron, Whelan, Cook, Wilson. Players mentioned; (12) Baker, Rickards, Breen, Knowles, Johnston, A. Wilson, Alex Mair, Cook, Whelan, Cameron, O'Bern, Freeman. Carlton 4th. Played 21, Won 14, Lost 7, Drawn 2, Goals For 71, Against 59. Carlton delegate Mr. Marshall moved to rescind the decision to award the game to Essendon against South Melbourne. "After reading counsel's opinion on the subject, he was satisfied that the association had not a leg to stand upon in the action it had taken, and therefore he had the courage, as one who had vote for making the mistake, to desire that the error should be set right." Some members said that as the Association had already made the wrong decision it should stick to that decision, because any revision would only make them a laughing stock to eyes the public. A vote was taken, 11-6, and the decision was reversed, and the match was declared a draw. A strong north wind blew across the ground making play difficult. Baker won the toss and Carlton kicked to the eastern end goal. Late into the game with scores level, Strickland had a set shot from close in to put the Blues in front, but his kick did not make the distance. Fitzroy then raced the ball up to other end where they scored the winning goal. Aitken, Baker, Breen, Bragge, Cook, T. Cameron, Drew, Johnston, Leydin, Melville, Merriman, A. Alex Mair, W. Alex Mair, McInerney, O'Bern, Rickards, Strickland, Whelan, A. Wilson, Woods. Best, Leydin, Baker, Whelan, O'Bern, Johnston. Players mentioned; (18) Whelan, Strickland, Melville, T. Cameron, Baker, Bragge, A. Wilson, Alex Mair, Alex Mair, Leydin, Johnston, Breen, Cook, Woods, O'Bern, Aitken, Merriman, Drew. Carlton 4th. Played 22, Won 14, Lost 8, Drawn 2, Goals For 72, Against 61. Peter Pindar's end of season review in The Australasian said that the popularity of the game continues unabated. At many games this year the crowd exceeded 15,000. The sharing of grandstand profits is a sticking point and the cricket clubs will not budge on the issue. Pindar believes this situation may change before the next season begins. Overall the quality of play has improved this year, although the goal kicking has not, especially place kicking. Little marking had degenerated into little more than just passing the ball. Pindar feels that the Association is too club minded, and should look at the big picture when it comes to Intercolonial games especially with N.S.W. and the V.F.A. 's absolute refusal to play matches against the London Rovers. The Association also erred at the removal of payments to goal umpires and it's overiding of a goal umpire's descion. The V.F.A. later amended it's decision on these two matters. He places Carlton's Jack Baker second, after South Melbourne's Peter Burns as the best player in the competition. Other Carlton players he mentions are Whelan as a follower. Backmen, J. Cameron and Crapp. Carlton takes up the fourth position with a senior record of Wins 10, Losses 8, 2 Drawn games. The Blues started the season well, but their form fell away. They seemed to be hanging onto to the lights of the past and should be looking at recruiting young talent from the district. The best players; Baker, Whelan, J. Cameron, T, Cameron, Crapp, Strickland, Johnston, O'Bern, A. Wilson, Cook, Drew, McInerney, Woods, Breen, Knowles, Leydin and Melville. Goals; Baker finished second in the V.F.A with 20, Breen equal third with 18, and A. Wilson fifteenth with 10. Meeting of the New South Wales Football Association. Clubs represented were; Sydney, East Sydney, West Sydney, City, Northumberland, Lambton, and Carlton (N.S.W.). The Carlton Story. Hugh Buggy and Harry Bell. Pages. 57,58, 259. The History of the Carlton Football Club. B. Hansen. Page. 61,62. The Camperdown Chronicle, 1885 editions. The Launceston Examiner, 1885 editions. North Melbourne Advertiser, 1885 editions. Australian Town & Country Journal (N.S.W. ), 1885 editions. Riverine Herald, Echuca 1885 editions. Contributors to this page: blueycarlton , molsey , nikki and admin . Page last modified on Tuesday 06 of February, 2018 08:54:56 AEDT by blueycarlton. 1977 Rd 16 - Percy Jones tackles Goss. 1984 State of Origin Profile; Wayne Johnston.